CINCINNATI -- Although it turned 100 last year, one of the things architect Jim Stapleton most appreciates about his Clifton home is that its design was ahead of its construction date. "It was modern for its time," he said. You can tour this home, along with six others and the Clifton Branch Library (once the home of George "Boss" Cox), during the May 13 Clifton House Tour. Presented by the Clifton Town Meeting, the tour takes place once every three years on Mother's Day. Stapleton and his wife, Dr. Beth Shaughnessy, bought the 3,000-square-foot home that they share with son, Evan, in 1998. They'd moved here from Los Angeles, where Shaughnessy had her residency, and soon decided they wanted to live in Clifton. Before they bought it, the home was in the Cassini family from 1917-1988. Architectural historian Walter Langsam identified the original owner as Remigio Cassini, who came to the United States from Venice, Italy, with two brothers in 1892. The trio founded a tile company with the Cassini name, Langsam noted. That business likely explains the mosaic tile around the living and dining room fireplaces, still there today. Original floor-to-ceiling tile can also still be seen in an upstairs bathroom. 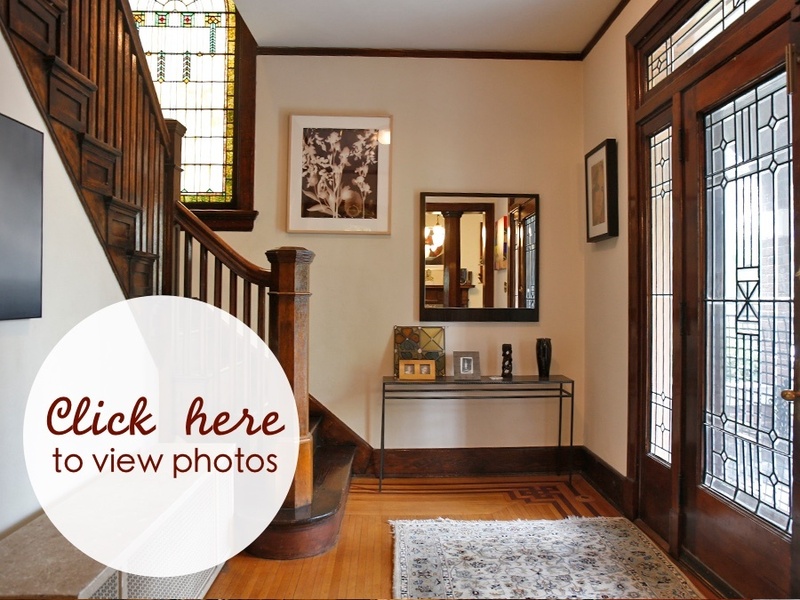 Beyond the tile, the home boasts many other original features -- flooring; many windows, including stained glass; and dark-stained woodwork that hasn't been painted over. The leaded glass in the front door may have been replaced, as a former neighbor recalled it being broken at one point. While many of the historical details are still there, Stapleton and Shaughnessy have made updates, including practical improvements such as adding air conditioning. Two years ago, they renovated the kitchen, with marble selected to reflect the room's previous incarnation. For more storage, they added cabinets, with shaded glass that goes from lighter to darker to create visual interest, in front of one window. They also chose paint with bronze dust to make cabinets pop. The most noticeable additions the couple made to the home are to the decor, which includes some custom furniture and lots of artwork, much of it from Contemporary Arts Center (CAC) auctions or created by the couple's friends. "Each piece has its own story, and that's the important part," Stapleton said. In the same room, plastic "vines" decorate the curtains, evoking the outdoors and the abundant plants in the adjacent sunroom. Shredded presentation books from FRCH Design Worldwide, where he is senior vice president and principal, create another piece of art. "At heart, I'm a minimalist, but there's nothing minimal about having 40 pieces of artwork on your wall," Stapleton said, referring to a gallery wall in the master bedroom. They're small pieces collected during 10 years of ArtWorks' "Secret ArtWorks" fundraiser. The third floor, where Stapleton has a workspace and a TV area, has colorful "floating rectangles" throughout (even access panels into the attic were integrated into the composition). A music room, decked out in posters of The Clash, The Ramones and Joy Division, reflects Stapleton's college days in a punk band (he plays guitar and a little bit of drums). Stapleton's favorites among all the pieces include an Interview magazine signed by Andy Warhol along with works by their friend Lisa Egeli, a portrait and landscape artist. One of her paintings is of the home's back yard. There's even a bit of art out in that back yard, with "Gaga for Cincinnati," from the 2012 Big Pig Gig. FRCH created it, complete with its bacon dress, for the event. Also outside are a pergola with wisteria, small ponds and flower beds. Stapleton converted the former three-car garage at the back of the quarter-acre lot into a greenhouse with a bar. Labeled "Jardin d'amis" (from the French "Garden of Friends") on the facade, it's a place to serve food during yard parties. Aside from the house itself, Stapleton said part of its appeal is the neighborhood, with its non-chain restaurants and eclectic feel. "You have all these different scales of houses," he said. "You get a really nice cross-section of people." "We really like the house, and we really like the neighborhood," he added. "We have great neighbors." Where: Eight locations in Clifton. Free parking available at Clifton Recreation Center, 320 McAlpin Ave., and Fairview-Clifton German Language School, 3689 Clifton Ave.
Tickets: $20 in advance; $25 day of tour. For sale at multiple locations in the Clifton Business District and on the event website .